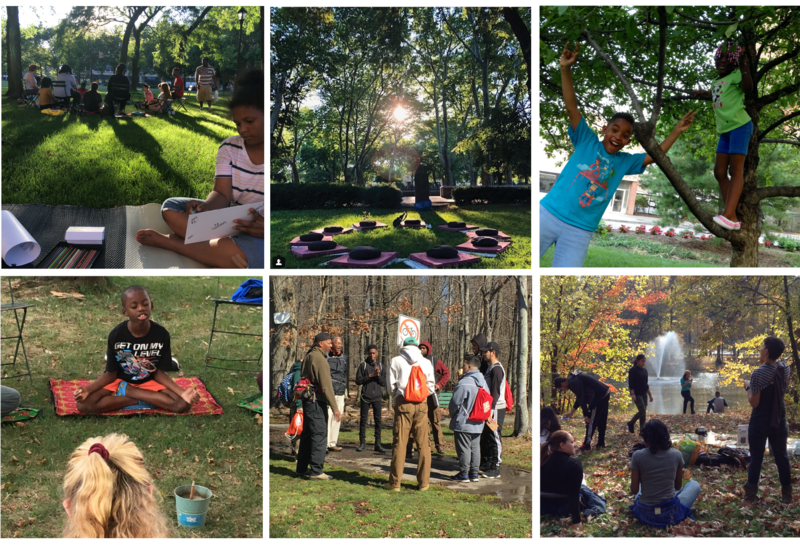 Some of our current and past nature programs, left to right, top to bottom: Child sits quietly near meditation circle at Military Park; our new meditation circle in Independence Park; children play at the trees; a child tries a few minutes of meditation, a boys/men mindful nature hike in South Mountain Reservation, an Earth Month pond clean-up and mindfulness in motion in Branch Brook Park with teenagers. The japanese have a practice called shinrin-yoku, translated to forest-bathing, that simply put means taking the forest in through our senses. To just be in nature, with no particular aim, can bridge the gap beween us and the natural world that we are intrinsically a part of, but too often we have lost touch with. We use all our senses of seeing, hearing, tasting, smelling, and touching to forest bath. Along with awakening the five senses to nature, we can elevate our sixth sense base of consciousness (present with all of these other senses) to a mind state of joy, kindness, and wholeness. Many of us have become so separate from nature as now the majority of the world’s population lives in cities. Though we might not often be able to go “into the woods”, we have our urban green spaces as little oases. If not for our own good, we need to consider exposing our urban-bred children to natural settings. There are significant and diverse studies that indicate that being in nature is important to children in their cognitive, emotional, social, and educational development.1 In a more natural way of putting it, we can say that children who experience natural settings are able to stay in touch with themselves and be more peaceful, which helps them to stay more focused and less fragmented. There too are clear class- and race-based inequalities in urban children’s exposure to the natural world as well as industrial environmental hazards1, but we as a community and as parents and caregivers can make informed choices as to how we use our precious time. At Newark Center for Meditative Culture (NCMC), being in nature has an important role in our teacher’s practices. Those in the community who keep up with us recognize that bringing nature programs and sessions to the community is a priority. This summer through the end of August, NCMC is offering two free opportunities to bath in urban nature with us and learn to meditate while you are at it. Each Tuesday we are running Meditation Classes in Independence Park in the Ironbound (translation into spanish and portuguese as requested). Downtown each Wednesday we are running Meditation Classes in Military Park. Weather providing, both start at 7:00pm and go to 8:00pm. These are Family Friendly programs, so we invite you to bring children who can sit quietly with us or play near us to get their first taste of mindfulness practice in nature. If you can’t sit with us, perhaps this information will inspire you to commit to engage with nature through local hikes and nature outings or as much as possible get out at lunch to sit at a tree, lay in the grass and look at the sky, or instead of gazing at a television screen or phone screen, step out at night to gaze up at the stars. For further information, contact Newark Center for Meditative Culture at info@newarkmeditation.org. This entry was posted in Ancestral Domain, Meditation, mindfulness, Uncategorized and tagged #meditation, #newarknj, ecologicalconsciousness, forestbathing, shinrinyoku, urbannature. Bookmark the permalink.